Rexroth added a new member to its product family of modular remote control systems: A lean control for controllable pitch propellers (CPP) based on the proven Marex OS platform. More than 10,000 units installed on vessels all over the world attest to the maturity and reliability of Rexroth’s Marex OS as a hardware and software platform for controlling ship propulsion systems. Its applications range from simple reversing gear systems to redundant controllable pitch propeller systems, for example on offshore supply vessels. 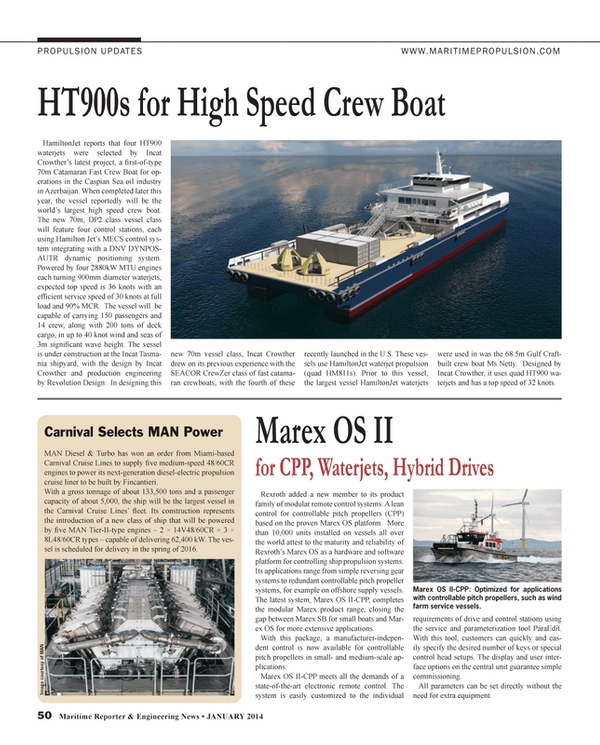 The latest system, Marex OS II-CPP, completes the modular Marex product range, closing the gap between Marex SB for small boats and Marex OS for more extensive applications. With this package, a manufacturer-independent control is now available for controllable pitch propellers in small- and medium-scale applications. Marex OS II-CPP meets all the demands of a state-of-the-art electronic remote control. The system is easily customized to the individual requirements of drive and control stations using the service and parameterization tool ParaEdit. With this tool, customers can quickly and easily specify the desired number of keys or special control head setups. The display and user interface options on the central unit guarantee simple commissioning. All parameters can be set directly without the need for extra equipment.